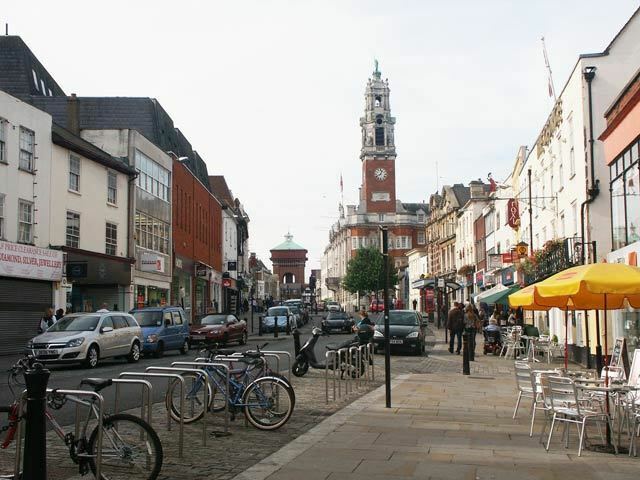 At the time of the census in 2011, it had a population of 121,859, marking a considerable rise from the previous census and with considerable development since 2001 and ongoing building plans; it has been named as one of Britain's fastest growing towns. As the oldest recorded Roman town in Britain, Colchester is claimed to be the oldest town in Britain. It was for a time the capital of Roman Britain, and is a member of the Most Ancient European Towns Network. Colchester is some 50 miles (80 km) northeast of London and is connected to the capital by the A12 road and its railway station which is on the Great Eastern Main Line. It is seen as a popular town for commuters, and is less than 30 miles (48 km) away from Stansted Airport and 20 miles (32 km) from the passenger ferry port of Harwich. Colchester is home to Colchester Castle and Colchester United Football Club. It has a Conservative Member of Parliament, Will Quince, who was elected in the 2015 General Election. The correct demonym is Colcestrian. The River Colne runs through the town. There is a variety of theories about the derivation of the name Colchester. Some contend that is derived from the Latin words Colonia (referring to a type of Roman settlement with rights equivalent to those of Roman citizens, one of which was believed to have been founded in the vicinity of Colchester) and Castra, meaning fortifications (referring to the town's walls, the oldest in Britain). 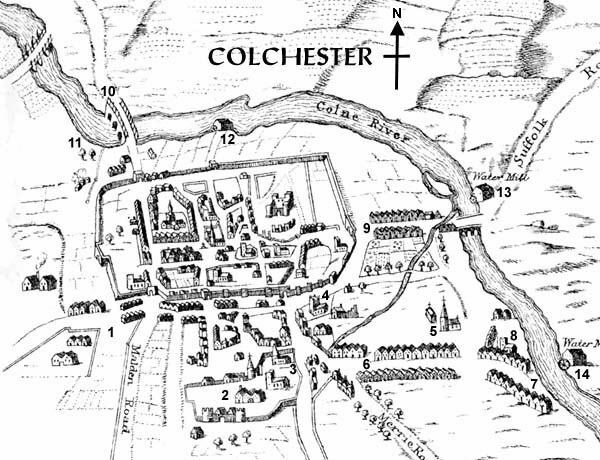 The earliest forms of the name Colchester are Colenceaster and Colneceastre from the 10th century, with the modern spelling of Colchester being found in the 15th century. In this way of interpreting the name, the River Colne which runs through the town takes its name from Colonia as well. Cologne (German Köln) also gained its name from a similar etymology (from its Roman name Colonia Claudia Ara Agrippinensium). Other etymologists are confident that the Colne's name is of Celtic (pre-Roman) origin, sharing its origin with several other rivers Colne or Clun around Britain, and that Colchester is derived from Colne and Castra. Ekwall went as far as to say "it has often been held that Colchester contains as first element [Latin] colonia ... this derivation is ruled out of court by the fact that Colne is the name of several old villages situated a good many miles from Colchester and on the Colne. The identification of Colonia with Colchester is doubtful." The popular association of the name with King Coel has no academic merit. The gravel hill upon which Colchester is built was formed in the Middle Pleistocene period, and was shaped into a terrace between the Anglian glaciation and the Ipswichian glaciation by an ancient precursor to the River Colne. From these deposits beneath the town have been found Palaeolithic flint tools, including at least six Acheulian handaxes. Further flint tools made by hunter gatherers living in the Colne Valley during the Mesolithic have been discovered, including a tranchet axe from Middlewick. In the 1980s an archaeological inventory showed that over 800 shards of pottery from the Neolithic, Bronze Age and early Iron Age have been found within Colchester, along with many examples of worked flint. This included a pit found at Culver Street containing a ritually placed Neolithic grooved ware pot, as well as find spots containing later Deverel-Rimbury bucket urns. Colchester is surrounded by Neolithic and Bronze Age monuments that pre-date the town, including a Neolithic henge at Tendring, large Bronze Age barrow cemeteries at Dedham and Langham, and a larger example at Brightlingsea consisting of a cluster of 22 barrows. Colchester is said to be the oldest recorded town in Britain on the grounds that it was mentioned by Pliny the Elder, who died in AD 79, although the Celtic name of the town, Camulodunon appears on coins minted by tribal chieftain Tasciovanus in the period 20-10BC. Before the Roman conquest of Britain it was already a centre of power for Cunobelin – known to Shakespeare as Cymbeline – king of the Catuvellauni (c.5 BC – AD 40), who minted coins there. Its Celtic name, Camulodunon, variously represented as CA, CAM, CAMV, CAMVL and CAMVLODVNO on the coins of Cunobelinus, means 'the fortress of [the war god] Camulos'. During the 30s AD Camulodunon controlled a large swathe of Southern and Eastern Britain, with Cunobelin called "King of the Britons" by Roman writers. Camulodunon is considered one of many possible sites around Britain for the legendary (perhaps mythical) Camelot of King Arthur. Soon after the Roman conquest of Britain in AD 43, a Roman legionary fortress was established, the first in Britain. Later, when the Roman frontier moved outwards and the twentieth legion had moved to the west (c.AD 49), Camulodunum became a colonia named in a second-century inscription as Colonia Victricensis. This contained a large and elaborate Temple to the Divine Claudius, the largest classical-style temple in Britain, as well as at least seven other Romano-British temples. Colchester is home to two of the five Roman theatres found in Britain, the one at Gosbecks (site of the Iron Age royal farmstead) being the largest in Britain, able to seat 5,000. Camulodunum served as a provincial Roman capital of Britain, but was attacked and destroyed during Boudica's rebellion in AD 61. Sometime after the destruction, London became the capital of the province of Britannia. Colchester's town walls c. 3,000 yd. long were built c.65–80 A.D. when the Roman town was rebuilt after the Boudicca rebellion. In 2004, Colchester Archaeological Trust discovered the remains of a Roman Circus (chariot race track) underneath the Garrison in Colchester, a unique find in Britain. The Roman town of Camulodunum, officially known as Colonia Victricensis, reached its peak in the Second and Third centuries AD. A hoard of jewellery, known as The Fenwick Hoard, has been discovered in the town centre. The director of Colchester Archaeological Trust, Dr Philip Crummy, described the hoard as being of "national importance and one of the finest ever uncovered in Britain." There is evidence of hasty re-organisation of Colchester's defences around 268–82 AD, followed later, during the fourth century, by the blocking of the Balkerne Gate. Dr. John Morris (1913 – June 1977) the English historian who specialised in the study of the institutions of the Roman Empire and the history of Sub-Roman Britain, suggested in his book "The Age of Arthur" (1973) that as the descendants of Romanised Britons looked back to a golden age of peace and prosperity under Rome the name "Camelot" of Arthurian legend was probably a reference to Camulodunum, the capital of Britannia in Roman times. The archaeologist Sir Mortimer Wheeler was the first to propose that the lack of early Anglo-Saxon finds in a triangle between London, Colchester and St Albans could indicate a 'sub-Roman triangle' where British rule continued after the arrival of the Anglo-Saxons. Since then excavations have revealed some early Saxon occupation, including a fifth-century wooden hut built on the ruins of a Roman house in present-day Lion Walk. Archaeological excavations have shown that public buildings were abandoned, and is very doubtful whether Colchester survived as a settlement with any urban characteristics after the sixth century. The chronology of its revival is obscure. But the ninth-century Historia Brittonum, attributed to Nennius, mentions the town, which it calls Cair Colun, in a list of the thirty most important cities in Britain. Colchester was in the area assigned to the Danelaw in c.880, and remained in Danish hands until 917 when it was besieged and recaptured by the army of Edward the Elder. The tenth-century Saxons called the town Colneceastre, which is directly equivalent to the Cair Colun of 'Nennius'. The tower of Holy Trinity Church is late Saxon work. Medieval Colchester's main landmark is Colchester Castle, which is an 11th-century Norman keep, and built on top of the vaults of the old Roman temple. There are notable medieval ruins in Colchester, including the surviving gateway of the Benedictine abbey of St. John the Baptist (known locally as "St. John's Abbey"), and the ruins of the Augustinian priory of St. Botolph (known locally as "St. Botolph's Priory"). Many of Colchester's parish churches date from this period. In 1189, Colchester was granted its first royal charter by King Richard I (Richard the Lionheart.) The charter was granted at Dover with the king about to embark on one of his many journeys away from England. The borough celebrated the 800th anniversary of its charter in 1989. Colchester developed rapidly during the later 14th century as a centre of the woollen cloth industry, and became famous in many parts of Europe for its russets (fabrics of a grey-brown colour). This allowed the population to recover exceptionally rapidly from the effects of the Black Death, particularly by immigration into the town. Rovers Tye Farm, now a pub on Ipswich Road, has been documented as being established by 1353. By the 'New Constitutions' of 1372, a borough council was instituted; the two baillifs who represented the borough to the king were now expected to consult sixteen ordinary councillors and eight auditors (later called aldermen). Even though Colchester's fortunes were more mixed during the 15th century, it was still a more important place by the 16th century than it had been in the 13th. In 1334 it would not have ranked among England's wealthiest fifty towns, to judge from the taxation levied that year. By 1524, however, it ranked twelfth, as measured by its assessment to a lay subsidy. Between 1550 and 1600, a large number of weavers and clothmakers from Flanders emigrated to Colchester and the surrounding areas. They were famed for the production of "Bays and Says" cloths which were woven from wool and are normally associated with Baize and Serge although surviving examples show that they were rather different from their modern equivalents. An area in Colchester town centre is still known as the Dutch Quarter and many buildings there date from the Tudor period. During this period Colchester was one of the most prosperous wool towns in England, and was also famed for its oysters. Flemish refugees in the 1560s brought innovations that revived the local cloth trade, establishing the Dutch Bay Hall for quality control of the textiles for which Colchester became famous. The old Roman wall runs along Northgate Street in the Dutch Quarter. The town saw the start of the Stour Valley riots of 1642, when the town house of John Lucas, 1st Baron Lucas of Shenfield was attacked by a large crowd. In 1648, during the Second English Civil War, a Royalist army led by Lord Goring entered the town. A pursuing Parliamentary army led by Sir Thomas Fairfax and Henry Ireton surrounded the town for eleven and a half weeks, a period known as the Siege of Colchester. It started on 13 June. The Royalists surrendered in the late summer (on 27 August Lord Goring signed the surrender document in the Kings Head Inn) and Sir Charles Lucas and Sir George Lisle were executed in the grounds of Colchester Castle. A small obelisk marks the spot where they fell. Daniel Defoe mentions in A tour through England and Wales that the town lost 5259 people to the plague in 1665, "more in proportion than any of its neighbours, or than the city of London". By the time he wrote this in 1722, however, he estimated its population to be around 40,000 (including "out-villages"). Colchester is noted for its Victorian architecture. Significant landmarks include the Colchester Town Hall and the Jumbo Water Tower. In 1884, the town was struck by the Colchester earthquake, estimated to have been 4.7 on the Richter Scale causing extensive regional damage. The Paxman diesels business has been associated with Colchester since 1865 when James Noah Paxman founded a partnership with the brothers Henry and Charles Davey ('Davey, Paxman, and Davey') and opened the Standard Ironworks. In 1925, Paxman produced its first spring injection oil engine and joined the English Electric Diesel Group in 1966 – later becoming part of the GEC Group. Since the 1930s the Paxman company's main business has been the production of diesel engines. In the early 20th century Colchester lobbied to be the seat for a new Church of England diocese for Essex, to be split off from the existing Diocese of Rochester. The bid was unsuccessful, with county town Chelmsford forming the seat of the new diocese. The University of Essex was established on the outskirts of the town at Wivenhoe Park in 1961. The £22.7M eight-mile A120 Colchester Eastern Bypass opened in June 1982. Colchester and the surrounding area is currently undergoing significant regeneration, including controversial greenfield residential development in Mile End and Braiswick. The town's football team, Colchester United, moved into a brand new stadium at Cuckoo Farm in 2008. Colchester, Camulodunum and Colonia Victricensis forms one of 38 sites seeking World Heritage Site status, with a shortlist to be submitted to UNESCO for consideration in 2011. The town was one of twenty-five across the UK that applied for city status to mark the Diamond Jubilee of Elizabeth II in 2012. It was unsuccessful. Colchester is in one of the driest regions of the United Kingdom with average annual precipitation at 635 mm (25.0 inches), although among the wetter places in Essex. Colchester is generally regarded as having an Oceanic climate (Köppen climate classification Cfb) like the rest of the United Kingdom. Its easterly position within the British Isles makes Colchester less prone to Atlantic depressions and weather fronts but more prone to droughts. This is because, like most areas in South-East England, Colchester's weather is influenced more by Continental weather patterns than by Atlantic weather systems. This leads to a dry climate compared to the rest of the UK all year round and occasional (relative) extremes of temperatures during the year (occasional high 20°Cs/low 30°Cs during the summer) and quite a few nights below freezing during the winter months (daytime high temperatures are seldom below freezing). Any rainfall that does come from Atlantic weather systems is usually light, but a few heavy showers and thunderstorms can take place during the summer. Snow falls on average 13 days a year during winter and early spring. The highest temperature recorded in Colchester was 36.1 °C (97 °F) in August 2003 (during the 2003 European heat wave), and the lowest was −9.4 °C (15 °F) in December 2010. Colchester has been an important military garrison since the Roman era. The Colchester Garrison is currently home to the 16th Air Assault Brigade. The Army's only military corrective training centre, known colloquially within the forces and locally as "The Glasshouse" after the original military prison in Aldershot, is in Berechurch Hall Road, on the outskirts of Colchester. The centre holds servicemen and women from all three services who are sentenced to serve periods of detention. From 1998 to 2008, the garrison area of the town underwent massive redevelopment. A lot of the Ministry of Defence land was sold for private housing development and parts of the garrison were moved. Many parts of the garrison now stand empty awaiting the second phase of the development. Since 2006, Colchester has been one of 12 places in the UK where Royal Salutes are fired to mark Royal anniversaries and visits by foreign heads of state. From 2009, these salutes have taken place in Castle Park. The Member of Parliament for Colchester is Will Quince (Conservative). The town is also represented on Essex County Council, containing six County electoral divisions. Villages within the borough are represented by various parish councils. The urban area of Colchester contains only one parish council (Myland Community Council) with the rest of Colchester Town being unparished. The seat of local government is Colchester Town Hall, a late-Victorian baroque edifice by John Belcher. It is the latest in a series of local government buildings to have stood on the same site since the 12th century. The 162-foot clock tower was presented by James Paxman; it is topped by a figure of St Helena, who is linked by legend to the town. The town's former MP, Sir Bob Russell, has held the ceremonial role of High Steward of Colchester since 2015. Colchester houses several museums. The Castle Museum, found within Colchester Castle, features an extensive exhibit on Roman Colchester. Nearby are Hollytrees Museum, a social history museum with children's exhibits in the former home of Charles Gray, and the town's Natural History Museum, located in the former All Saints' Church. The Colchester Archaeological Trust have opened a visitor centre and museum at the former Cavalry Barracks to display finds from the Roman Circus, with replicas and models of the circus, as well as finds from the nearby Roman cemeteries. In 2014 brick and marble columns from the monumental façade of the precinct of the Temple of Claudius were discovered behind the High Street, with plans to make them visible to the public. Gosbecks Archaeological Park is situated south-west of the town, and consists of a preserved Roman theatre and Romano-British temple marked out on the ground. The park was the location of a large high-status late Iron Age farmstead, known as "Cunobelin's farm" after the Catuvellauni king, whose coin moulds were found in large quantities at the site. In the Roman period the site was the location of a large Romano-British temple and Britain's largest Roman theatre, twice as large as the one in the town. The park is also close to the post-conquest Stanway burials, a Roman fort and the still-extant defensive earthworks of the Iron Age fortress (the most extensive of their kind in Britain). The Iron Age earthwork ditch and bank defences are open to the public as wooded parkland. Opened in 1972, the Mercury Theatre is one the region's leading repertory theatres. Located nearby is Colchester Arts Centre, a multi-function arts venue located in the former St Mary-at-the-Walls church, and home of the Colchester Beer Festival. The Headgate Theatre is also located in Colchester. firstsite is a contemporary art organisation, based in the Visual Arts Facility, which was designed by Rafael Viñoly, and opened in September 2011, at a total cost of approximately £25.5 million, £9 million more than the original estimate. The Minories houses The Minories Galleries, which is managed by Colchester Institute and presents contemporary exhibitions by artists from the region. The building is owned by the Victor Batte-Lay Foundation. There are several other bars with live music in the town.. In 2009, an art collective called 'Slack Space' took up some of the closed-down shops in the town and converted them into art galleries with the hope of promoting art and design in the town. The Colchester School of Art and Design is based in the Colchester Institute near the centre of the town. Colchester Film Festival the largest film festival in Essex takes place annually in October showcasing a selection of new feature and short films by filmmakers from around the world. The town's link with football had begun with the amateur club Colchester Town, formed in 1867 and dissolved in 1937. They were succeeded by professional club Colchester United, who compete in Football League Two (as at Season 2016-17) and play home games at Colchester Community Stadium. Founded in 1937, the club entered the Football League in 1950. Colchester United Ladies play in the FA Women's Premier League Southern Division. 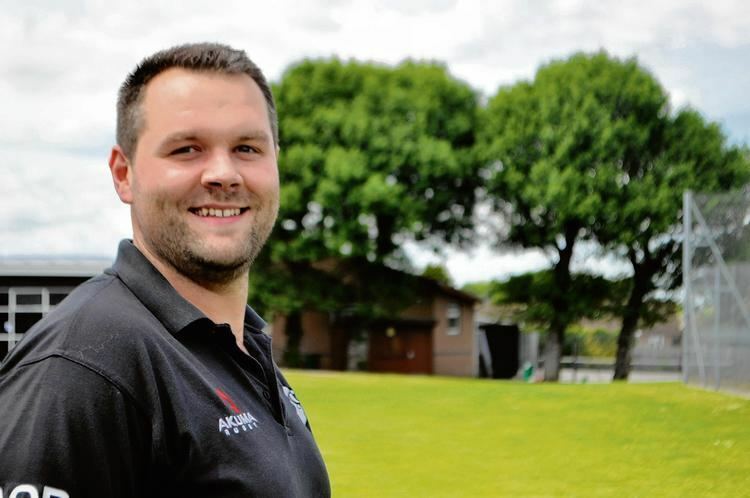 Other sports teams based in the town include Colchester Rugby Football Club, Colchester Gladiators American Football Club, Colchester Weight Lifting Club, Colchester Powerlifting Club (ColPower) and Colchester & East Essex Cricket Club. Essex County Cricket Club play some of their home games at Castle Park Cricket Ground, home of Colchester & East Essex. Sports facilities in Colchester include the sports centre, Colchester Leisure World, Colchester Garrison Athletics Stadium (a co-operative facility used by both the army and civilian population), and a skatepark. Colchester Zoo is a large zoo based in the Stanway area on the outskirts of town. Construction of the walls of Colchester took place between 65 and 80 AD, shortly after the destruction of the undefended colonia by Boudicca, and they continued in use until after the Siege of Colchester in 1648. Two large stretches of the wall are still standing on the west and north sides and a number of fragments are visible along the rest of the circuit. A notable survival is the Balkerne Gate, which is the earliest and most complete Roman gateway in the United Kingdom. A circular walk of nearly 2 miles (3.2 kilometres) follows the course of the wall and the surviving portions. Completed in 1883 when the Town Council took over Colchester's water supply, the 110-foot (34-metre) water tower was originally called the "Balkerne Water Tower", but soon became known as "Jumbo" because of the its large size, which prompted the addition of an elephant-shaped weather vane at its peak. The tower was decommissioned in 1987 and has had several private owners pending redevelopment. The Town Hall is built on the site of the original moot hall, first recorded in 1277 and demolished in 1843. Replacing a Victorian town hall which had become unstable, work on the present building started in 1897 to the design of John Belcher in the Edwardian Baroque style, and was opened in 1902 by former prime minister, the Earl of Roseberry. The building dominates the High Street and the 192-foot (58.5-metre) Victoria Tower is widely visible. The tower was intended to commemorate the Diamond Jubilee of Queen Victoria and was funded by a donation from James Noah Paxman, the founder of Davey, Paxman & Co. It features four allegorical figures by L J Watts representing engineering, military defence, agriculture and fishery. At the top of the tower is a large bronze figure representing Saint Helena (the patron saint of Colchester) holding the True Cross; a local story says that a councillor was dispatched to Italy to find a statue of the saint, but could only find one of the Virgin Mary, which then had to be modified locally. Just below this statue are four bronze ravens by Francis Carruthers Gould, which represent the portreeve who ran Colchester's medieval port. The tower contains a chiming clock with five bells, and another 15th century bell which is thought to have hung in the original moot hall. The main facade of the Town Hall features six life-sized statues, also by Watts, depicting famous people connected with Colchester; on the south elevation, Eudo Dapifer, Thomas Lord Audley, William Gilberd and Samuel Harsnett, and on the east, Edward the Elder and Boudicca. The interior features a marble staircase with a statue of Queen Victoria and a monument to the Colchester Martyrs. The first floor comprises a mayoral suite, a committee room and the council chamber with a painted ceiling and stained glass by Clayton and Bell. The second floor is occupied by a large assembly hall called the Moot Hall, which features a fine pipe organ by Norman and Beard. As is the case for the rest of Essex, Colchester's state schooling operates a two-tier system. Two of the town's secondary schools are selective, Colchester Royal Grammar School and Colchester County High School, the remainder being comprehensives. Comprehensive secondary schools include Gilberd School, Colchester Academy, Philip Morant School and College, St Helena Media Arts College, St Benedict's Catholic College and the Thomas Lord Audley School. The University of Essex is located to the east of Colchester in Wivenhoe Park, in the civil parish of Wivenhoe. Other tertiary institutions include Colchester Sixth Form College and Colchester Institute. Private schools in Colchester include St. Mary's School, Oxford House School and Colchester High School. Colchester has a bus system (run mostly by First Essex and Arriva Colchester, as well as Hedingham Omnibuses, Beeston's, Ipswich Buses, Panther Travel (Essex), Chambers and Regal Busways) which mostly uses bus station in Osborne Street on the southern edge of the town centre. Colchester railway station is located on the Great Eastern Main Line operated by Abellio Greater Anglia. Town is also served by Colchester Town railway station and Hythe station located on the Sunshine Coast Line. Colchester is linked to London by the A12. Colchester is reputed to be the home of three of the best known English nursery rhymes: 'Old King Cole', 'Humpty Dumpty' and 'Twinkle, Twinkle Little Star'. The legitimacy of the claims for the first two of these is disputed. Local legend places Colchester as the seat of King Cole (or Coel) of the rhyme Old King Cole, a legendary ancient king of Britain. The name Colchester is from Latin: the place-name suffixes chester, cester, and caster derive from the Latin word castrum (fortified place). In folk etymology the name Colchester was thought of as meaning Cole's Castle, though this theory does not have academic support. In the legend Helena, the daughter of Cole, married the Roman senator Constantius Chlorus, who had been sent by Rome as an ambassador and was named as Cole's successor. Helena's son became Emperor Constantine I. Helena was canonised as Saint Helena of Constantinople and is credited with finding the true cross and the remains of the Magi. She is now the patron saint of Colchester. This is recognised in the emblem of Colchester: a cross and three crowns. The Mayor's medallion contains a Byzantine style icon of Saint Helena. A local secondary school – St Helena's – is named after her, and her statue is atop the town hall, although local legend is that it was originally a statue of Blessed Virgin Mary which was later fitted with a cross. Colchester is also the most widely credited source of the rhyme Humpty Dumpty. During the siege of Colchester in the Civil War, a Royalist sniper known as One-Eyed Thompson sat in the belfry of the church of St Mary-at-the-Walls (Humpty Dumpty sat on the wall) and was given the nickname Humpty Dumpty, most likely because of his size, Humpty Dumpty being a common insult for the overweight. Thompson was shot down (Humpty Dumpty had a great fall) and, shortly after, the town was lost to the Parliamentarians (all the king's horses and all the king's men / couldn't put Humpty together again.) Another version says that Humpty Dumpty was a cannon on the top of the church. The church of St Mary-at-the-Walls still retains its Norman tower until the top few feet, which are a Georgian repair. The third rhyme to come from Colchester is Twinkle Twinkle Little Star, which was written by Jane Taylor in the town's Dutch Quarter, and published in 1806 with the title "The Star". Colchester has also been suggested as one of the potential sites of Camelot, on account of having been the capital of Roman Britain and its ancient name of Camulodunum: this is not considered likely by academics, as in Arthurian times Colchester was under Saxon control. The first part of Daniel Defoe's Moll Flanders was set in Colchester. Colchester was also a named line of lathe machinery. The opening credits for the British TV comedy show Blackadder Goes Forth and a scene from the film Monty Python and the Meaning of Life were both filmed at Colchester's former cavalry barracks. The Doctor Who episodes The Lodger and Closing Time are set in Colchester, although they were filmed in Cardiff. In the Asterix comic book Asterix in Britain the Camulodunum rugby team wins a game against Durovernum (Roman name for Canterbury). The uniforms worn during the match in the book are similar to the modern kit of Colchester United. Prominent members of Blur, a popular 1990s music group met at school in Colchester. During the "Princesses on Parade" sequence in the 1994 film The Swan Princess, one of the princesses in the beauty pageant is said to come from Colchester. The verse says: "This princess comes from Colchester, where corn and cotton grows. She plays croquet and harpsichord, and sews her own clothes." Thomas Audley, 1st Baron Audley of Walden (1488–1544) – Lord Chancellor of England 1533–44, founder of Magdalene College, Cambridge. St Michael's Church, Berechurch has a monument to him (in the Audley Chapel). Margaret Thatcher (1925–2013) – Prime Minister, lived in Colchester when working in Manningtree as a research chemist in the 1950s. Archibald Wavell (1883–1950) – British Field-Marshal during World War II, Viceroy of India. Mary Whitehouse (1910–2001) – Christian morality campaigner, died in Colchester.